Mary Lisa Gingras, a healthcare professional in Nashville, used to feel a twinge of dismay at the thought of a woman getting caught up in prostitution, addiction or human trafficking. But her emotions didn’t go much further than that. Until she learned about the work and ministry of Thistle Farms. Six years ago, Gingras and her husband Mike, members of Christ Presbyterian Church, were looking for a way to serve their community. A friend invited them to learn more about Thistle Farms and its residential program, Magdalene. 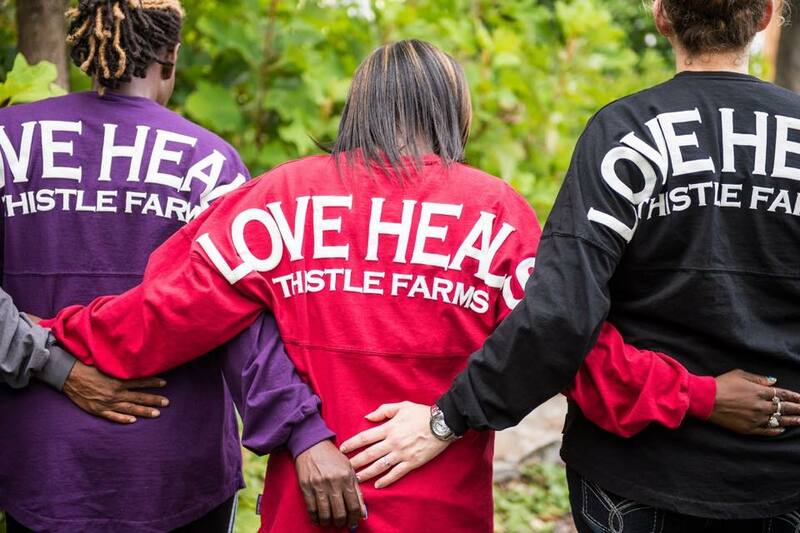 Thistle Farms and Magdalene were conceived in Nashville more than 20 years ago to help women survivors of trafficking, addiction and prostitution. Over time, the social enterprise has grown into a thriving company with bath and home items (handmade by the women) that have gained national attention. While the organization had been successful in selling its products, securing financial support, and inviting people to frequent its onsite Café, it needed committed community members to engage in purposeful, healthy relationships with the women living at Magdalene, the residential arm of Thistle Farms. Under Magdalene’s services, women can experience transformative, sustainable recovery through two years of rent-free housing, healthcare, employment and community building. Soon after learning about Magdalene, Gingras and a group of other volunteers from the Nashville area began organizing monthly activities with the women enrolled in the residential program. The group eventually grew into the missional community known as Magdalene MC and today includes 30 rotating volunteers from several different area churches. As Gingras and others began getting to know the women enrolled in Magdalene, they learned that the roots of prostitution and trafficking are often found in severe childhood abuse, loss and/or neglect. It is these childhood experiences that can push women toward homelessness, addiction, prostitution, trafficking, and incarceration. Pictured: Mary Lisa Gingras (second from right) and other Magdalene MC volunteers. The missional community quickly got to work planning once/month outings—including visits to places such as Cheekwood Botanical Gardens and Brushfire Pottery. They also began hosting an annual etiquette dinner, where they take a light-hearted approach to teaching the women everyday manners. Someone in the group even created a humorous rap song that outlines proper placement of cutlery. As friendships began to form, the Magdalene women shared their stories. Gingras remembers how her own heart shattered when she learned that one woman had maintained a fairy tale life with a husband and children until a surgical procedure left the woman in excruciating pain. She developed an addiction to pain pills in order to cope. Eventually her desperation for funds led her to prostitution. Another resident at Magdalene revealed she’d been sold into trafficking by her family at age 14. Still others confessed that an addiction to drugs had overwhelmed them and led them to secure money the only way they could see how—through selling their bodies. Gingras realized in many cases these women were just trying to survive. Members of the missional community shared the peace, joy and contentment that believers can experience when they surrender their pain to God. The group witnessed one Magdalene resident receive Christ this year as she began studying Scripture. Another woman, a Magdalene graduate, felt God leading her to start a recovery program for women coming out of prostitution in her home state of Texas. To learn more or get involved with the Magdalene missional community, contact Mary Lisa Gingras at gingrasml@comcast.net, Susan Garvey at susegarvey@gmail.com or Sharon Kinney at Sharonskinney@yahoo.com.